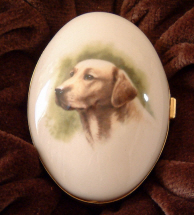 An attractive shaped ceramic Labrador Dog trinket box by 'Pointers of London'. Open the box to reveal a further picture of a mallard duck inside the lid. A lovely gift. Gundog tie clip. Bearing the famous Stratton brand name this item is exclusive to Elegant Extras and looks great on a plain wool tie. Cute photo frame for the loved family pet.